In Vermont, families own approximately two-thirds of the state’s forestland. Sustainable management of family woodlots could provide future generations with social, economic, and environmental benefits, such as revenue from the forest, jobs, recreation, clean water, and other nonmarket goods and services. But how sustainably are these family-owned forests being managed? With support from the Northeastern States Research Cooperative, researchers at the State University of New York College of Environmental Science and Forestry in collaboration with Vermont foresters examined sustainable forest management on family-owned properties across four northern Vermont counties: Chittenden, Washington, Caledonia, and Essex. Professor René Germain and former graduate students Neal Maker and Nate Anderson evaluated the use of silvicultural practices and best management practices (BMPs) on 59 woodlands of at least 25 acres in size harvested in the previous five years. Researchers interviewed landowners and conducted intensive field surveys of properties. They learned that enrollment in Vermont’s Use Value Appraisal Program (UVA) for forestland taxation was positively related to sustainable management practices. Also called Current Use, UVA is Vermont’s primary forest management policy instrument intended to promote the use of silvicultural practices and BMPs on family forests. By relieving tax burdens, the program also encourages owners to keep land open and undeveloped. Researchers explored connections between management practices and UVA. All 43 enrolled properties in the study area had forest management plans, as required by the program, whereas only 1 of the 16 unenrolled properties had a plan. Although not a requirement of the program, foresters administered harvests on 27 of the 43 enrolled properties, while only 1 of the unenrolled properties had a harvest administered by a forester. Implementation of regeneration harvests in the study area gave Vermont high points. Such harvests have rarely been observed in other studies in the Northeast. Their use in Vermont suggests that landowners and forest managers are considering future stand conditions and long-term potential to produce another forest crop. It is likely that UVA is shifting landowners’ behavior toward sustainable forest management. UVA enrolled properties also scored significantly higher in application of logging skid trail and water diversion device-related BMPs than did unenrolled properties. Despite these positive trends on UVA-enrolled properties and the fact that Vermont rates higher than other studied eastern states in the use of sustainable forest practices, the state has some improvements to make in sustainable management of family owned woodlands. Researchers observed an overall prevalence of nonsilvicultural harvesting practices in the study area which reveals that policy alone is not achieving widespread sustainable forest management among family forest owners in Vermont. Effects of nonsilvicultural practices are being felt in the marketplace as sawmills report decreased log quality and lower per log volumes. In general, properties in the study area lacked BMP implementation around stream crossings and water diversion devices, suggesting that efforts to improve BMP use in the region will be most effective by focusing on these deficiencies. Although UVA-enrolled properties scored highly, adoption of UVA by Vermont landowners is somewhat limited with approximately 40% of eligible land enrolled. On the other hand, current use programs with high enrollment (i.e., New Hampshire with 60%) are often focused on maintaining open space, with varying levels of attention to sustainable forest management. UVA is a good example of a program that requires a strict management plan, encouraging landowners to hire a forester to implement the plan. County foresters also monitor requirements through site visits, which may account for the program’s success in promoting sustainable forest management on enrolled properties. 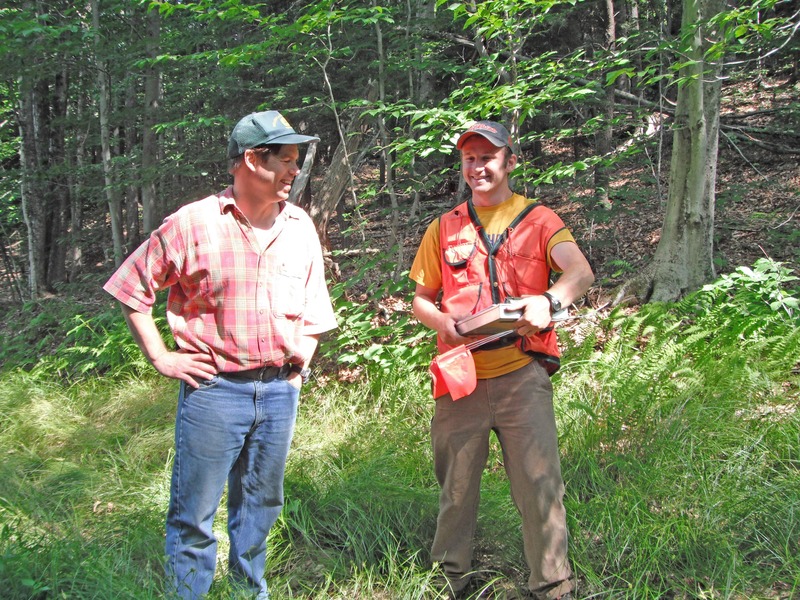 Foresters provide critical expertise to develop and monitor the forest management plan. Actual implementation of silviculture and BMPs requires professional loggers. Loggers well-versed in BMPs and silviculture are often participants in logger certification programs, such as Vermont’s Logger Education to Advance Professionalism (LEAP). Sustainable forest management is more likely to happen when all three sides of the forest management triangle (landowner, forester, logger) are working together to achieve landowner objectives through a management plan. To increase sustainable forest management in the study area, the researchers recommend that existing programs such as UVA be maintained. In addition, expansion of local and county-based outreach and education programs coordinated with state and federal incentives offers a logical next step to address local conditions and potentially reach landowners who may be resistant to enrollment in initiatives such as UVA.